In a couple of weeks ‘Project Wild Thing‘ will be launched. It’s a film documenting one man’s attempt to get his kids to play outside and thus inspire a nation that would rather be on their X-boxes than out in the woods getting muddy. So it’s fitting that we’ve had a weekend of living the Wild Thing dream. I’ve written before of the challenges I’ve had getting my own offspring to venture forth into the wide and wild open. So it is with great joy that I can document here, with delighted smugness, the kind of weekend that would make a Guardian lifestyle features editor drool. So here are my very own 8 steps to Wild Thing Nirvana. Obviously this can be anywhere – park, woodland or wild place, but we happened to be on a raised beach surrounded by hazel and birch woodland on the shore of a Scottish loch. And the weather was OK. Step Two: A wild swim. After a long, hot walk-in, the sea was startlingly cold. Daughter managed a few strokes then stood waist-deep looking for sealife in the weed. Ignoring the pain of constricting capillaries in the extremities I paddled frantically until a warm glow started to spread over my body. Slowing to a more stately neck-out breast stroke, I parted the seaweed clad in an invincible tingling aura. Anyway I think the aura was from the cold water, it could have been from the smugness. A sure-fire way of warming up, the kids sailed out over the 20ft drop and nearly into the branches of the (hopefully sturdy) oak tree. Fighting over whose turn it was must have been warming too. Absolutely standard fare for being a Wild Thing. Our den was built with the help of a length of blue fishing rope found on the beach and some twigs from the woods. It was a pretty good lunch spot and we plucked a few trefoils of wood sorrel to have in our sandwiches. Step Five: Watch the sunset. In the uncharacteristically warm late September evening we sat outside and watched the constellations gradually appear. We also happened to be listening to radio 3 and a performance of Tintagel by Arnold Bax, which is obviously too pretentious for words but daughter wanted a soundtrack and this was the only one we could agree on. In any case, it suited the occasion, the lapping of the waves on the beach and the wind in the grass. This is where a bit of that evil screen-time hugely increased our enjoyment of the experience. The wonderful Night Sky app showed us the names of the constellations and significant stars and satellites. We even saw a few shooting stars. I’ve only experienced phosphorescence once before and it was under similar conditions: a warm autumn night after a long hot summer. We wandered down to the water’s edge, splashed our hands and, sure enough, a few sparks of phosphorescence shot into the dark and disappeared. It took a lot of splashing for a couple of sparks but, what magic sparks they were. Step Eight: Sleep out under the stars. This is obviously the absolute pinnacle of Wild Thing achievement. It wasn’t really something we intended but the idea had started germinating last week when I received an email telling me that someone had sponsored me to sleep out in my garden. This wasn’t a phishing scam from a criminal gang-turned environmental education collective. 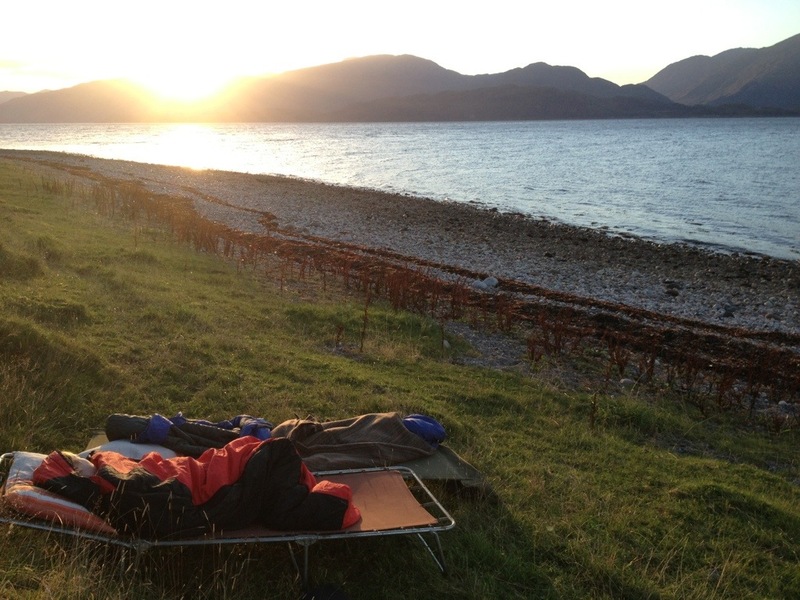 It was related to a test page I set up on JustGiving while organising the RSPB Big Wild Sleepout in August. Somehow, someone had tracked down my page and felt moved to sponsor me, but they hadn’t left any contact details, leaving me in a bit of a dilemma. I was fretting about the morality of being unable to contact my benefactor to tell them I was a fraud when the inevitability of a night out au naturel dawned. We dragged camp beds and sleeping bags down to the beach – daughter categorically banned me from taking an actual bed and mattress down. I had planned to just lie and look at the stars and listen to the waves for a while but almost immediately we were both asleep. We didn’t manage a whole night though. The night sky had rotated around the North Star by about 60 degrees when I was awoken by a frozen cold daughter and we sprinted back into relative warmth. So, I hope that puts my sponsorship dilemma to bed so I can sleep at night again (sorry couldn’t resist). Next year I think I’ll go the whole hog and get properly sponsored for a proper sleepout.